Our ever-expanding collection contains e-books appropriate from early childhood through to academic level. Britannica’s e-books can be accessed from any computer, tablet or mobile device online or downloaded for offline use, enabling users to access information while travelling or at home. They are conveniently grouped into collections for ease of access, topics include science, music, religion, history, literature, inventors and innovators, technology and biology. The newly updated Britannica Student Encyclopedia helps children gain a better understanding of the world through more than 2,250 captivating articles. Children are sure to immerse themselves in thousands of photos, charts and tables that help explain concepts and subjects, as well as 1,200 maps and flags from across the globe. What types of e-books are in Britannica’s E-book portal? How do I access Britannica E-books? 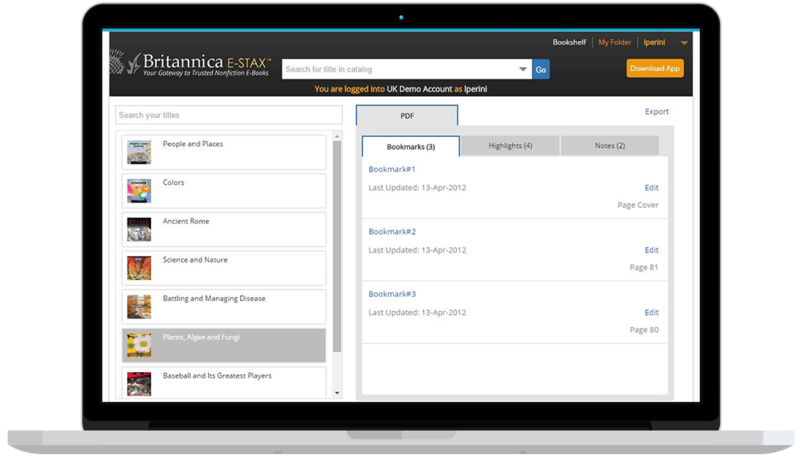 What special features are included on the Britannica E-stax platform? Can an individual leave notes in an E-book? How will the Britannica team support my subscription?